Lunchtimes are the perfect opportunity for children to get active and continue their learning in a fun and enjoyable way. Whether playing sports or organised games, this time is vital in encouraging children to enjoy physically active play and interactive games. AJB Sports in Education’s activity programmes and lunchtime clubs allow your pupils to improve their overall fitness and learn valuable skills during their lunchtimes. They will improve coordination, balance, flexibility and agility in a fun, creative and safe environment. 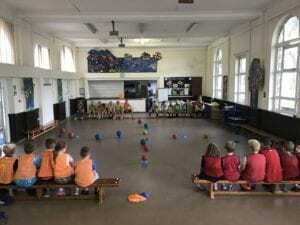 AJB Sports in Education offer either a Sport Specific Lunchtime Club or a fun Multi Sports Games Club, both of which can be run indoor or outdoors, dependant on your school’s specific needs and facilities. As with everything that AJB Sports in Education offers, we are happy to work with your school’s individual and unique needs to ensure that all programmes are tailored in the best interests of your pupils.